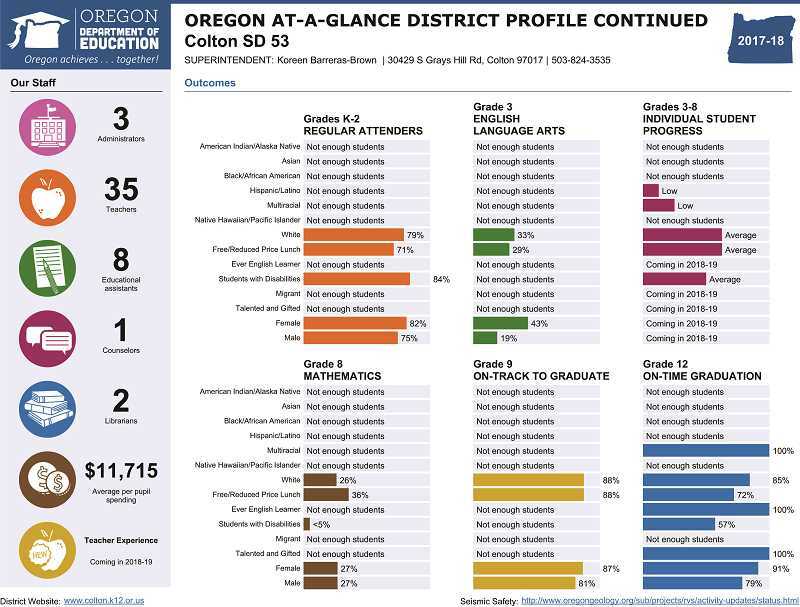 Just as schools release student report cards to track progress, so also school districts and their schools receive report cards published by the Oregon Department of Education. ODE released those report cards this fall for the 2017-18 academic year. 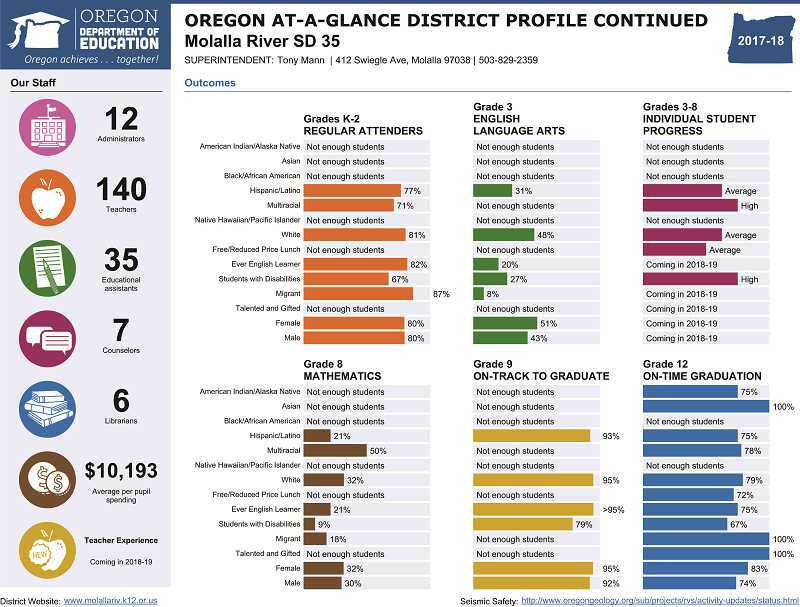 The "At-A-Glance" reports, pictured here, provide a quick look at the Molalla River and Colton school districts' overall performance, attendance, demographics and more. Colton's report card shows the district—made up of 605 students, 3 administrators and 35 teachers—has some room for improvement, with four of six highlighted statistics falling below the state average. Yet the district appears to be excelling in a few key ways. One way the school is succeeding is by hiring teachers who are as diverse as the students—a step forward compared to neighboring districts whose teachers do not represent the student population. In Colton, 7 percent of students are Hispanic or Latino, and comparatively, 10 percent of teachers are Hispanic or Latino. "We have a fair and equitable hiring practice and all hiring supervisors are trained on it," said Superintendent Koreen Barreras-Brown. "It is important in any community that the schools represent the entire population. Ultimately, as educators, we need to know and understand the students and families we serve." Other areas of the report card show room for growth. One determinant of future student success is how frequently students attend school at a young age. The report shows that 78 percent of Colton's students in kindergarten through second grade are regular attenders—students who attend more than 90 percent of their enrolled school days. This is 5 percent below the Oregon average, which sits at 83 percent. To improve, Colton School District staff members have agreed to write a goal pertaining to chronic absenteeism. "We participate in the Kaiser Chronic Absenteeism Grant with CESD and regional school districts," said Barreras-Brown. "We are moving forward in building an outreach program for families. We are getting feedback now to better personalize our efforts." The district also falls below the state average in Grade 3 English Language Arts, with 33 percent of students meeting state grade-level expectations, a 6 percent decrease from last year and well below the Oregon average at 48 percent. The district's grade 8 mathematics statistic shows 27 percent of students are meeting state grade-level expectations, down from the previous year and below Oregon's average of 41 percent. However, Colton is barely below the state average when it comes to grade 9 students who are on track to graduate, with 84 percent being on track compared to the state's 85 percent. This is up significantly from the previous year. Similarly, the on-time graduation rate is up and is above the state average. In Colton, 86 percent of students graduate on time, compared to 77 percent of all Oregon students. The key to this success, according to Barreras-Brown, is providing multi-tiered systems of support in the areas of reading, writing, math and social/emotional/behavioral development. "We are attending to the social, emotional and behavioral needs of our students as follows: collaborating with Clackamas County mental health onsite, creating a teacher on special assignment (TOSA) for social, emotional and behavioral development, implementing trauma-informed and restorative practices, and developing a goal for 100 percent of our students to graduate," Barreras-Brown said. Colton also spends more per student on average, compared to neighboring districts, at $11,715 per student. For more information, visit Oregon.gov/ode. Molalla is a bigger school district, with 2,680 students, 12 administrators and 140 teachers. 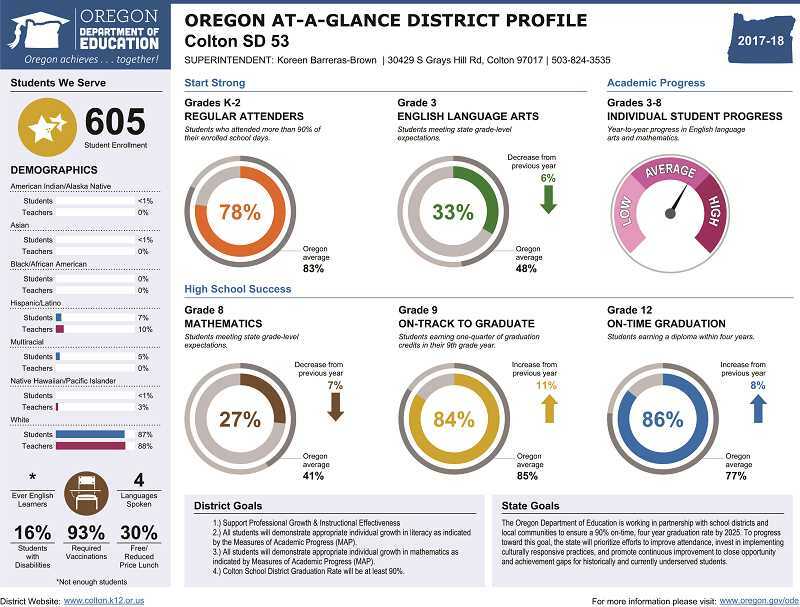 Molalla's marks are mixed, with half of the highlighted statistics falling below the state average and other statistics looking excellent relative to the state average. The report card highlights the percent of regular attenders in grades K-2—students who attended more than 90 percent of their enrolled school days. 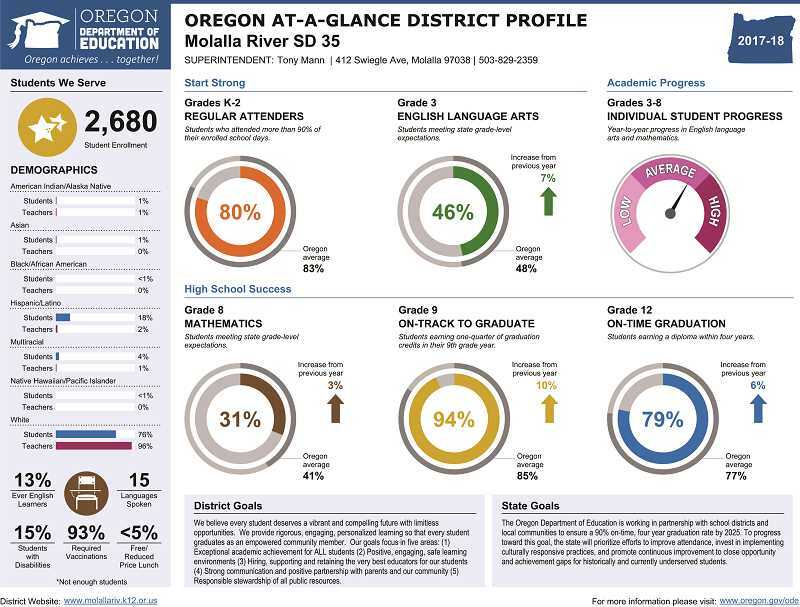 Molalla's regular attenders, at 80 percent, hits just below the state average of 83 percent. Molalla's grade 3 English language arts score is up this year to 46 percent meeting grade-level standards, inching toward Oregon's average of 48 percent. The third score that falls below the state average is the grade 8 mathematics, which shows 31 percent meeting grade-level standards, opposed to Oregon's 41 percent. But this score is on the rise, up 3 percent from the previous year. "The District Profile data shows our student performance improving in key areas like third grade reading and middle school mathematics," said Superintendent Tony Mann. "We are especially pleased that individual student progress year-to-year is above average in Molalla." Another potential area of opportunity has to do with demographic information. Molalla's teachers don't quite represent the diverse student population, with 96 percent of teachers listed as "white." Just 76 percent of students are listed as "white." The report also shows 18 percent of students are Hispanic or Latino, while just 2 percent of teachers are Hispanic or Latino. "It is true that we have greater diversity among our student population than our teaching staff," Mann said. "Among our district priorities is hiring a talented and diverse workforce of educators and support staff." Molalla spends less per student on average and has fewer instructional assistants per student than neighboring districts, factors which can affect student achievement. After ongoing teacher contract negotiations were finally resolved this fall, it's possible both may improve in coming years. But according to Mann, the district has certain higher costs than other districts. "Personnel costs are the largest part of any school district budget," Mann said. "Additionally, in our case, the general fund costs associated with maintaining our aging facilities are higher than many surrounding districts." While the district eyes continued improvement in the previously mentioned areas, the district is excelling when it comes to on-time graduation. The report shows 94 percent of Molalla's ninth-graders are on track to graduate, compared to Oregon's 85 percent; and 79 percent of Molalla students graduate on time, above Oregon's 77 percent. "I believe the freshman on-track to graduate data that places our district among this strongest in the region is a reflection of what's happening at MHS," Mann said. "I believe it is also, in part, a reflection of what's happening at MRMS, too. The middle years are critical times socially, emotionally and academically for kids as they are growing up, and our staff are paying attention to those unique needs." For more on Molalla's district profile, visit Oregon.gov.ode.